A form used by construction equipment, tools and supply, rental and leasing companies. 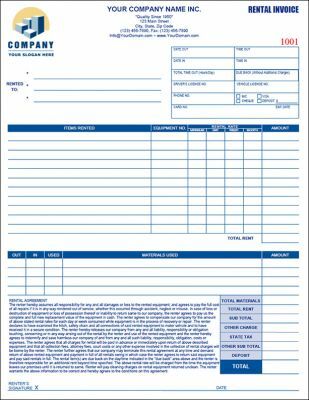 Form records customer name, date and time in/out, items rented, tool serial numbers, rental rates and materials used. Total summary section to sum all totals. Bottom of form contains industry standard, rental agreement for renter's signature. Construction equipment and tool, lease and rental agreement. 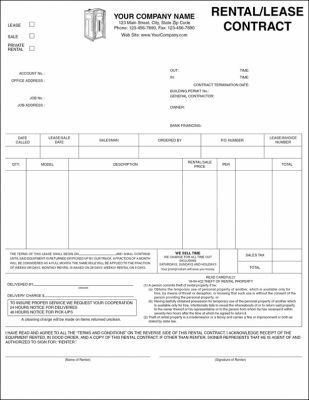 This form is used by companies that lease and rent construction equipment, tools and building supplies to contractors and established customer. The form contains sections to record customer account number, name, service address, contact person and other important lessee information. 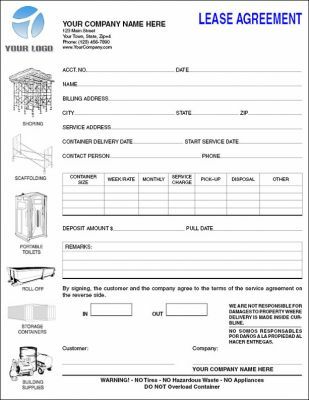 Form can be changed and edited to fit rentals for scaffolding, portable sanitation units, roll-offs, storage containers and more. A form used by construction equipment, tools and supply, rental and leasing companies. Has sections to enter account number, job address, in/out times and more. Columns record quantity, model, description, rental or sale price per, hours/days/months, late return fees, delivery date and location, etc. and total amount. Form includes industry standard disclaimers and legalese sections at bottom of page and signature lines. This combination Construction Equipment Rental and Lease Agreement will help close the deal to rent construction equipment faster.